Is it true that a comet collided with Jupiter? 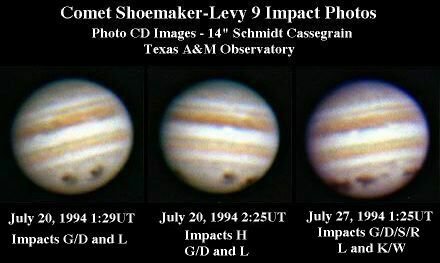 Yes, the shattered comet Shoemaker-Levy 9 collided with Jupiter over a 5.6 day period in July 1994. The first of 21 comet fragments hit Jupiter on July 16, 1994 and the last on July 22, 1994. The 21 major fragments were denoted A through W in order of impact, with letters I and O not used. All of the comet fragments hit on the dark farside of Jupiter. The impact of the center of the comet train occurred at a Jupiter latitude of about -44 degrees at a point about 67 degrees east (toward the sunrise terminator) from the midnight meridian. These impact point estimates from Chodas and Yeomans were only 5 to 9 degrees behind the limb of Jupiter as seen from Earth. About 8 to 18 minutes after each fragment hit, the impact points rotated past the limb. After these points crossed the limb it took another 18 minutes before they crossed the morning terminator into sunlight as seen to the right.